Why do minority communities in California seem to be a target for foreclosures by OneWest Bank, a national bank with 75 retail branches in Southern California? That’s the question posed by the California Reinvestment Coalition, a group of more than 300 nonprofit organizations and public agencies that advocate for Californians’ fair and equal access to banking and other financial services. 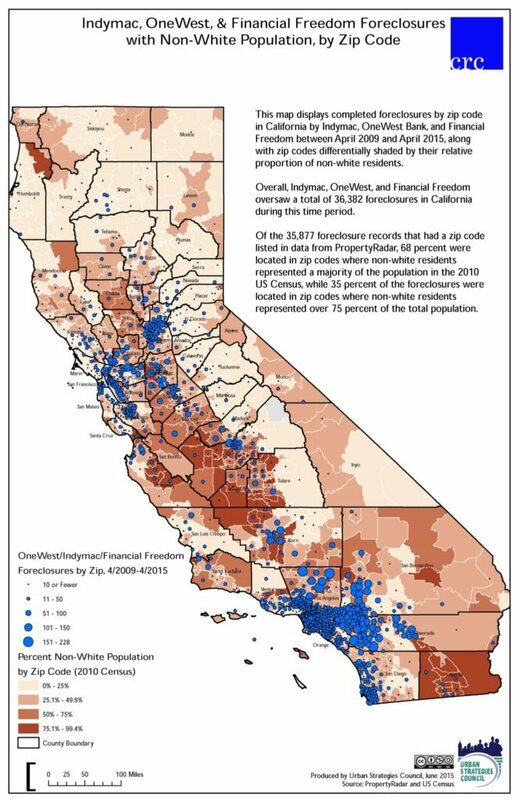 The coalition says it has compared data on the 35,000 foreclosures that OneWest and its mortgage servicing subsidiary, Financial Freedom, have conducted in California since April 2009 to U.S. Census data and found that thousands of the bank’s foreclosures are taking place in predominantly nonwhite communities. California Resource Commission’s foreclosure map. According to the coalition’s analysis, 68 percent of the foreclosures are in ZIP codes where the nonwhite population is 50 percent or greater, and 35 percent of the foreclosures are in ZIP codes where nonwhites comprise more than 75 percent of the total population. Affected counties include Los Angeles, Riverside, San Bernardino, San Diego, Orange, Sacramento, Kern, Alameda and Contra Costa, the coalition said. OneWest has a reputation for taking an aggressive approach to foreclosing on properties. The bank began operations in 2009 with the acquisition of certain assets and limited liabilities of Independent National Mortgage Corp., more commonly known as IndyMac, after IndyMac filed for Chapter 7 bankruptcy and was seized by the Federal Deposit Insurance Corp. The bank has also been the subject of many court actions around the country concerning its foreclosure on properties where borrowers claimed that it failed to follow proper procedure or otherwise violated their rights. “OneWest’s mortgage servicing has been widely criticized, and these data increase our concerns that bad servicing practices may have had an outsized impact on communities of color. These are issues that need to be carefully investigated by the regulators,” Stein said. Stein also questioned whether federal regulators should investigate these issues in light of CIT Group’s acquisition of OneWest last year for $3.4 billion. The bank will be merged with CIT’s commercial banking subsidiary and be called CIT Bank. But the coalition is also concerned about other factors. For starters, the coalition alleges that OneWest has only about 15 percent of its branches in low- and moderate-income communities. The coalition is also concerned that Financial Freedom has a “troubling track record with quickly moving to foreclose on surviving heirs (most often women and seniors) after the death of a borrower. “At a February Federal Reserve hearing, surviving spouses and other surviving family members cited multiple problems with Financial Freedom, including that foreclosure alternatives are not shared with heirs, heirs are given mixed messages and inaccurate information, and homeowners and other heirs are not able to speak with a single point of contact as Financial Freedom racks up foreclosure costs,” the coalition alleges. Finally, the coalition alleges that the bank is also not extending mortgage loans to certain minority groups, charging that according to the Home Mortgage Disclosure Act (HMDA) data provided by OneWest, in 2012 and 2013 the bank originated 50 percent fewer purchase and refinance mortgages than the industry average to Asian-American Pacific Islanders — and of the 43 purchase or home improvement loans originated by OneWest in the Los Angeles area in 2012, none were to African-Americans. That trend continued in 2013, when none of the 28 purchase or home improvement loans went to African-Americans in Los Angeles, according to the coalition. OneWest declined to comment on the coalition’s allegations. Foreclosures are a documented crisis in California, particularly among minority homeowners. A 2012 Center for Responsible Lending Report concluded that the delinquency rate for both Latinos and African-Americans exceeded 10 percent, and rates for Asians and whites were high as well, at 7 percent. The center also reported in a 2011 research report, “Lost Ground,” that Latinos and African-Americans were hardest hit by the foreclosure crisis, and that minority borrowers, who were targeted by subprime lenders and the most likely to get loans with the riskiest product features, had much higher rates of completed foreclosures. Other banks, including SunTrust Mortgage Inc., Bank of America, Citibank and JPMorgan Chase, have entered into multimillion-dollar settlements with regulators in recent years to resolve similar allegations.